There are many reasons why you'd want to visit Montenegro, but the country's beauty can become a bit addictive, and the best places to stay in Montenegro take advantage of that. Romantic and picturesque, Montenegro is an old charmer with a dangerous edge as well as one of the world's most beautiful coastlines. Here the mountains rear up to meet the sea and there's only a narrow band of land between them, whilst in some places there's nothing but sheer cliffs. To this narrow strip cling ancient, orange-coloured walled towns, while the interior is rugged, under-explored and primeval, full of bears and wolves. Montenegro occupies a fascinating global position, between east and west, and its history has been dramatic, as well as devastating. This convergence of eastern and western cultures has led to a richly layered national identity and culture. And you'll see this in every town or city, with a smattering of catholic spires, richly decorated Orthodox churches, minarets from Mosques and even the odd Roman villa here or there. Since the war and the break up of Yugoslavia, visitor numbers have started growing, and the infrastructure has really improved. There are lots of new and refurbished roads, which seriously improve travel times. So it's now very easy to explore more than just the sparkling, rocky coastline. The number and quality of hotels, and those our Gurus have included in their list of the best places to stay in Montenegro, has significantly improved as well, so now is a great time to visit. Podgorica is the capital city, a pleasant place with lots of green space, excellent galleries and bars. While Cetinje is the historic capital, nowadays it's a kind of over-grown village where ambassadors' mansions and princely palaces sit alongside relatively modest homes. This is a great place to come if you want to uncover more of Montenegro's chequered past. If you want to tick all Montenegro's boxes visit Kotor, a true beauty, perfectly positioned for dramatic effect between a rim of mountains and a crystal clear bay, and set on stone fortifications begun in the 9th Century. It ticks the beach box, the historic box and the scenic box, and the labyrinth of the old town, with a wealth of wonderful churches, cafes and restaurants and boutiques, is Heritage Listed. Another good spot on the Bay of Kotor is Herceg Novi, with obligatory charming old town and fabulous views. If you're looking for a timeless escape, you'll find one just along the coast from Kotor. Perast is an elegantly fading pearl of a town with orange rooftops dotted with the romantic domes and cupolas of its 16 churches and 17 palaces - for a population of only about 500. There's only one main street, running down the hill to the narrow promenade along the bay, so the beauty is even more concentrated. You'll find Venetian looking monuments sprouting bougainvillea in amongst all this, as well as date trees and wild figs, scenting the air. Follow the coast to the south of Kotor and you'll get to Sveti Stefan. It's a stunning little place and worth a visit, even if just for a night. If you want to really escape from everything, head into the mountainous interior and you'll easily be able to hike or bike yourself into total privacy. If you're in Kotor then be sure to wander around the historic city walls, which are not only architecturally impressive but also offer wonderful views of the surrounding countryside. They will lead you high above the town to St John's fortress from where you can see for miles. Spend a day at the Tara River Canyon, Europe's deepest canyon and the second deepest in the world. Hike around the area or go rafting down the river if you fancy something a little more action-packed. Take a trip to Lake Skadar. It's the largest lake in Southern Europe and lies on Montenegro's border with Albania. The Montenegran side is National Park and plays host to large bird population. It is simply stunning and well worth a day away from the coast. Go swimming in the picturesque Blue Grotto in Herceg Novi, with its crystal clear water and wonderful natural caves. Be sure to bring along a camera! The best places to stay in Montenegro are hugely popular during July and August. So if you want to visit during peak season, book well ahead. Otherwise, visit during quieter months when the weather is still good and the streets much emptier! Hotel Adrovic, located just above Sveti Stefan beach, offers charming traditional accommodation with lovely sea views. Plus, there are self-catering suites available - perfect for family trips. 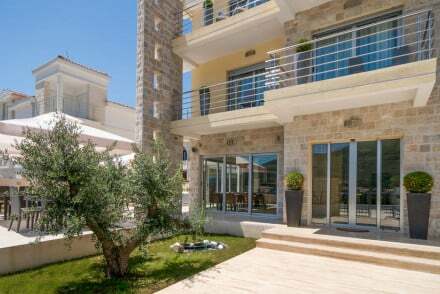 Boutique Hotel Casa del Mare is a sandstone new build with its own private beach acess on the bay of Herceg Novi. Their rooms are big, bright and spacious as well as having private balconies to make the most out of the ocean views. 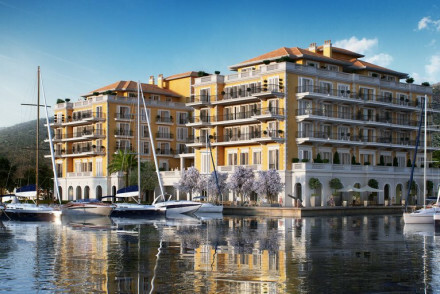 Regent Porto Montenegro is a luxurious spot on Tivat's seafront. Modelled after Venetian style architecture and with contemporary classic accommodation, there's also a top of the range spa and an excellent restaurant. A wonderful stay! 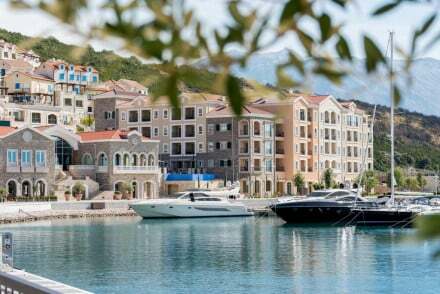 If you're thinking of honeymooning in Montenegro, this one may be for you, the Hotel Per Astra: a small, opulent hotel in beautiful surroundings. Each room and suite has been individually styled, with an eye for romance, and the hotel pool has spectacular views over the Bay of Kotor. Plus there's an excellent restaurant and a state-of-the-art spa. Hotel Azimut boasts a splendid location overlooking the bay of Sveti Stefan, providing creamy rooms and suites with private balconies and exposed brick work. With a top-notch seafood restaurant, spa, indoor pool and the beach around the corner, this is the ideal choice for a romantic getaway. Hotel Hippocampus oozes charm, their traditional exposed brick work contrasting with stylish contemporary interiors. Enjoy superb meals at their Montenegrin restaurant before unwinding at sunset on the rooftop terrace and admiring the views. Hotel Forza Mare enjoys a supreme setting on the bay of Kotor's waterfront and with the mountains in the background. Offering an eclectic array of 'around the world' themed rooms, there's also a wonderful seafood restaurant, top-notch spa and even private beach access! A stunning stay. The Astoria Hotel is a gorgeous, nine room boutique hotel in the centre of Kotor's old town. The atmosphere is romantic and opulent: think subtle lighting, marble, rich fabrics and private balconies. Plus, there's an excellent seafood restaurant and rooftop terrace. The Hotel Hippocampus also has nine rooms, and is also in Kotor's old town, this time overlooking the bay. Rooms are sophisticated and have all the mod. cons., whilst there's an excellent restaurant serving local specialities. You're just a short stroll from all the major sights of Kotor. 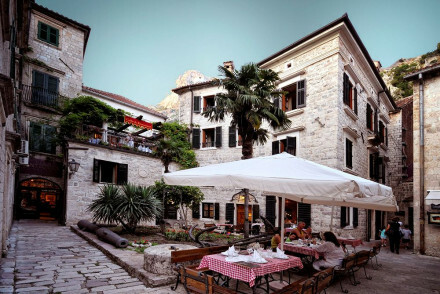 Hotel Monte Cristo is set in a lovely traditional house in Kotor's Old Town. Offering rustic rooms in pastel colours, you're in the perfect location for both sightseeing and making the most out of the beach. The Palazzo Radomiri is located on the coast, between Perast and Kotor, and this gorgeous seven room villa also offers wonderful views out to the bay. Rooms are traditional but chic, and there's a fabulous Balkan-Mediterranean fusion restaurant. Aman Sveti Stefan is a luxury vilage paradise located on the islet of Sveti Stefan. Stay in their country chic rooms and suites, (some of which have their own private pools), choose between three fantastic restaurants and indulge in the extensive spa facilities. A fantastic blend of privacy and provision. Hotel Aurel is a contemporary property in the heart of Podgorica. Their minimalist rooms feature floor-to-celiing windows and soft hues, whilst you can enjoy international cuisine on the scenic terrace. Plus, you're just a stone's throw away from the city's hotspots. 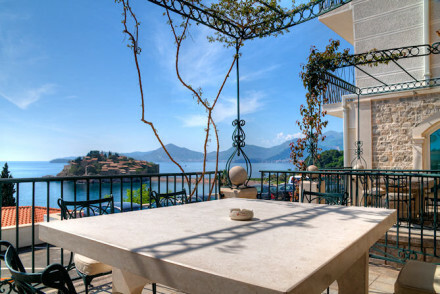 Hotel Villa Duomo offers an array of boutique rooms and suites in Kotor's Old Town. Providing traditional chic accommodation with exposed brick work and antique furnishing, this spot truly oozes charm. If you think you'd be best served by a self-catering option then browse through the wide variety available with our partner, booking.com. You're probably best off visiting Montenegro in the summer, with July and August experiencing average temperatures of 26°C. Be warned though that this is peak season, so you might want to book ahead as the best places to stay in Montenegro get filled up quickly at this time of year! There are two international airports to choose from: Podgorica and Tivat. Alternatively you can fly to Dubrovnik, which is just over the border with Croatia to the north. From Podgorica into the centre of town, take the L20 bus at a cost of €2. If you're heading to Buva, from here hop on the bus towards Budva Bus Station (costing €6) and you'll be there in around an hour and a half. However, if you land at Tivat then you'll need to either prebook a private transfer or hop in a taxi to your destination. Expand your search to include the best places to stay in neighbouring Croatia or Serbia. A boutique collection of rooms and 1-3 bedroom apartments in Kotor's Old Town. Traditional bedrooms have stone walls and elegant furnishings. Small kitchenettes, living areas, and a lovely communal terrace. Ideal for families, groups of friends or a couple. Excellent value too. Romantic Break - Studio and one bedroom apartments offer flexibility and privacy. Families - Two and three bed apartments. Sights nearby - St. Triphon Cathedral, Kotor Old Town Walls, Sveti Stefan, Cetinje. A gorgeous traditional house in Kotor's Old Town. Beautiful rustic rooms in soft pastel colours. Lovely breakfast balcony and walking distance to all the attractions; restaurants, bars, nightclubs, the beach. A characterful choice for a romantic holiday in Kotor. Sights nearby - St. Triphon Cathedral, Kotor Old Town Walls, and Church of the Nativity of the Virgin Mary. A boutique hotel just above Sveti Stefan beach. Charming rooms, suites, and multi-bedroom suites all in eclectic style. Stunning views from the terrace restaurant and just a short walk to three surrounding beaches. Family friendly and excellent value. Families - Two, three and four bed suites are ideal for families or groups of friends. Traditional - Slightly dated but wonderfully boutique. 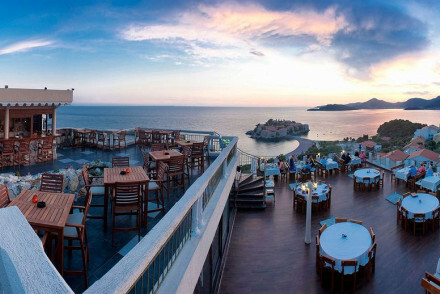 A stunning boutique hotel overlooking the bay of Sveti Stefan. Beautiful rooms, suites and apartments have exposed brick work, creamy furnishings, all the mod cons and private balconies. Wonderful seafood terrace restaurant, top of the range spa and indoor pool, moments from the beach. Views - Stunning views out to Sveti Stefan. Sights nearby - Kotor, Cetinje, Perast. A superbly luxurious hotel on the sea front in Tivat. Venetian style architecture with modern furnishings and stylish interior design. Rooms and suites are contemporary classic with all the mod cons and private balconies. Fabulous Mediterranean cuisine and top of the range spa. Sights nearby - Sveti Stefan, Cetinje, Lake Skadar, Budva, Kotor. A luxury hotel in the heart of the brand new Lustica Bay development, The Chedi is the place to stay. Luxurious rooms and suites are contemporary in style and offer floor to ceiling windows and balconies for admiring the views. Plus there's a private beach, variety of dining & top notch spa! Sights nearby - Explore the stunning Kotor Bay, or venture inland and discover Montenegro's beautiful countryside. 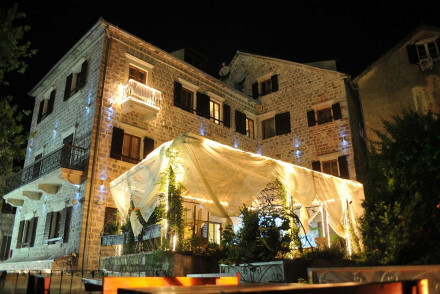 A superbly opulent hotel in beautiful Perast. All rooms are suites individually styled with romantic flair. Spectacular views from the pool over the Bay of Kotor, excellent restaurant and top of the range spa. Perfect for a romantic break or a honeymoon. Romantic Break - Each suite is romantically decorated in individual themes. Views - Stunning sea views over Kotor Bay. Opulent - Plenty of classical opulence combined with state of the art facilities. 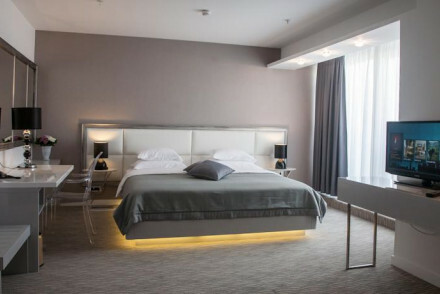 A contemporary hotel right in the heart of Podgorica. Light rooms with floor to ceiling windows, soft hues and minimalist style. An indulgent spa to unwind in after a day exploring the city. International cuisine served in a romantic setting; the terrace is particularly scenic. A chic city base. Value chic - A well priced smart hotel just a few minutes walk from the centre of Podgorica, with excellent facilities.